The 12-month forecast through May 2019 shows deficits of varying intensity covering Australia’s southeast quadrant. Deficits are expected to be extreme to exceptional in Tasmania, along the coast of South Australia, some pockets of Victoria and New South Wales, and in Western Australia near Busselton. Deficits ranging from moderate to severe are expected in the Murray-Darling Basin with some isolated pockets of greater intensity. Some moderate deficits are forecast for central South Island New Zealand and a pocket of more intense conditions north of Auckland. Significant deficits are forecast for New Caledonia. As is apparent in the map series above, the forecast indicates that intense deficits that have dominated a vast stretch of Australia in prior months will diminish considerably though deficits of varying severity will persist, particularly in the southeast. From September through November moderate to extreme deficits are expected across much of Victoria and New South Wales (NSW). Deficits will increase in Tasmania with exceptional deficits covering much of the western half of the state. A pocket of intense deficits in the tip of Western Australia (WA) will shrink slightly. Deficits in Northern Territory (NT) near Darwin and in the Daly River region will persist, ranging from moderate to exceptional. Moderate deficits are forecast in an arc from Kimberley Region in Western Australia, scattered along the Gulf of Carpentaria, and into lower Far North Queensland. Surpluses are forecast for the Mackenzie River region and Atherton Tablelands of Queensland, the Dampier Peninsula in WA, and Arnhem Land NT. In New Zealand, moderate deficits are forecast for central South Island, and more intense deficits north of Auckland on North Island. Deficits in New Caledonia will downgrade slightly but remain intense. From December through February deficits will continue to shrink and downgrade, leaving primarily moderate deficits in Victoria and NSW, though deficits may be severe in the Riverina region. Exceptional deficits will persist in the Blackwood River area of WA’s southwest tip, and severe to extreme deficits will persist in western Tasmania. Moderate to severe deficits are forecast for New Caledonia and some moderate deficits are forecast for New Zealand. 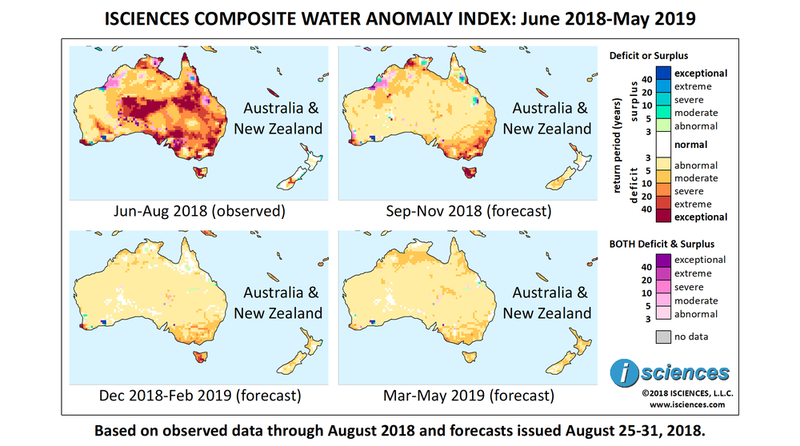 The forecast for the final months – March through May – indicates moderate deficits across northern Australia, in the southeast, and in New Zealand and New Caledonia. Across the continent of Australia, hazardous wildlife encounters abound as animals venture into cities and suburbs in hunger- and thirst-fueled migrations. Thirsty emus invaded the town of Broken Hill, New South Wales, Australia in search of water amid a harsh drought in the region. The emus, which are generally not adapted to urban life, have been injured by cars and involved in fights with pet dogs. On the other side of the country in Western Australia camels ventured farther south than usual, ultimately meeting their demise as declared pests by the hand of a farmer. Australian farmers and citizens on social media are contending with the idea of the federal government seizing hay exports to supply drought-stricken domestic cattle and dairy farmers. CEO of the Australian Fodder Industry Association advised against the idea, saying that diverting exports to local farmers would collapse the domestic hay market once hay stocks return to normal and threaten the $500 million (USD $363 million) export industry. Seizure would require the declaration of a state of emergency, and Australia’s Minister of Agriculture said there is no plan for forced compulsory hay acquisition at this time. Wool prices have increased up to 180 percent over the last two years driven by drought in Australia, which produces about 23 percent of the world’s wool. Top fabric makers in India have invested more in polyester wools in recent years to buffer against profit losses, having been unable to pass on the price increases to consumers. The island nation of Fiji announced a state of drought after receiving no rain for ten weeks. 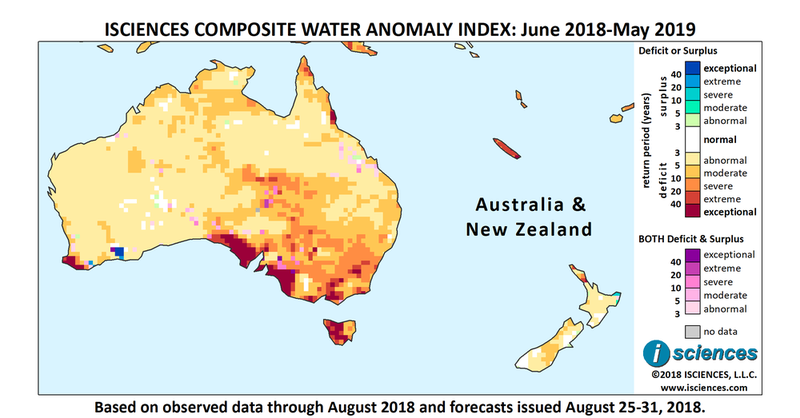 A dry near-term forecast agitates concern for agricultural activities, and the threat of bushfires is expected to continue through October according to the country’s Director of Meteorological Services.